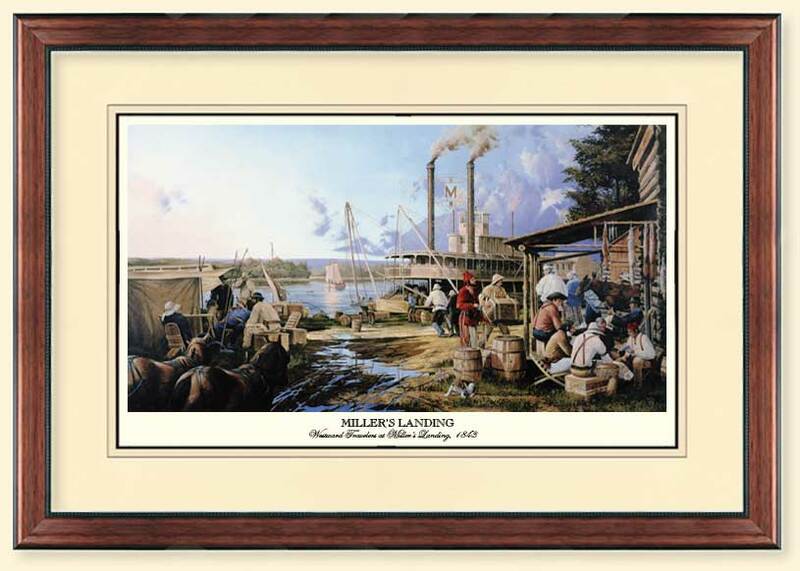 "Westward Travelers at Miller's Landing, 1843" is a depiction of life as it was in a small Missouri River port in 1843. 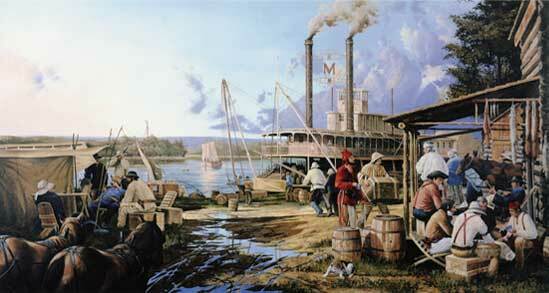 There were many landings along the river where travelers would stop for a rest or perhaps do some trading of goods. Miller's Landing was founded by Phillip Miller. As a businessman, Mr. Miller earned his living by operating a wood yard. Steamboats used the stop as a place to replenish their supply of firewood for their ravenous boilers burned between 10 and 25 cords of wood per day. Through the years, Miller's Landing became a center for commerce. Many people anxiously awaited the arrival of supplies from the East; or, perhaps sat on the front porch of the general store with eyes trained on the river awaiting the first site of smoke from the tall chimneys of an approaching steamboat. In 1856 the railroad was built through Miller's Landing. Today it is known as New Haven, Missouri.